I am so excited because it’s finally December! I will be bringing you one post every day for the next 12 days for the annual 12 Days of Christmas Blog Hop where I join 50 other talented ladies to bring you Christmas inspiration and cheer! Last year I made this ornament out of an old Easter egg, LOL! 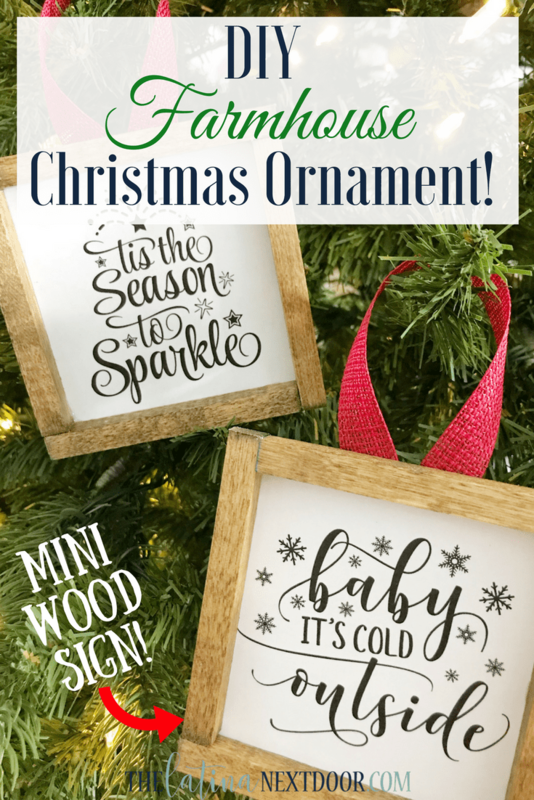 But today’s post is a tutorial on how to make an adorable DIY Farmhouse Christmas ornament wood sign. It will cost less than $1 to make because you will already have most of the supplies at home. 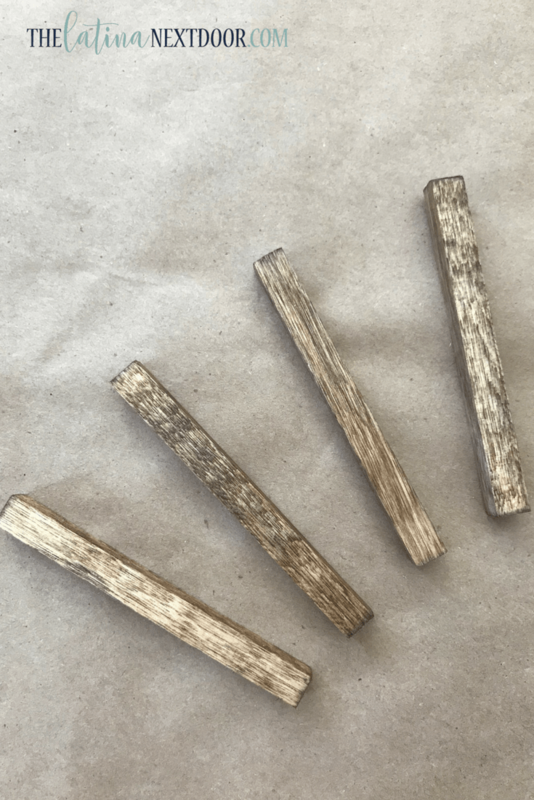 You want to cut your dowels down to 3.75 inches, sand the edges (they won’t need much), then stain them with your wood stain of choice. Wipe off the excess stain and let dry overnight. Glue your dowels together with the E6000 glue. This is how I did mine since I wanted a square shape and they were all the same length. Print out what you want on your mini sign. You can find a lot of free printables on Pinterest or you can make your own. 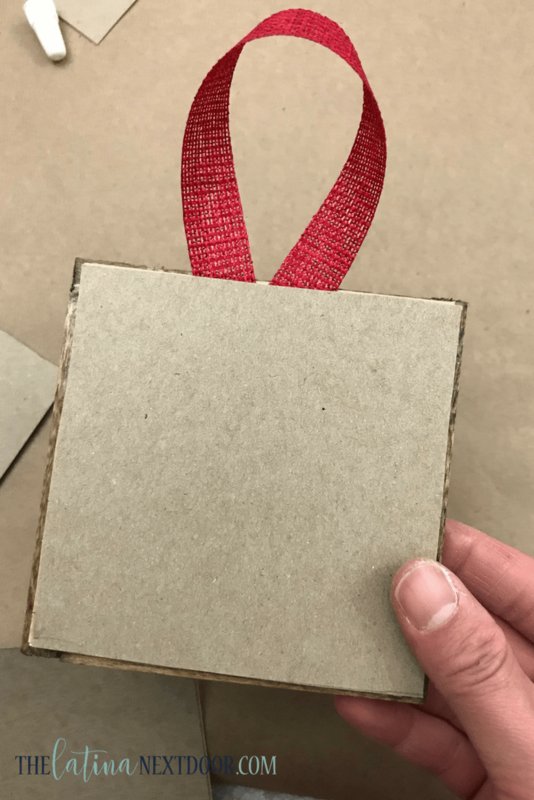 Cut them out and glue them onto thin cardboard for a little more sturdiness. I used a combination of cereal boxes and an old calendar etc. Use the E6000 to glue the paper adhered to the cardboard onto the wooden frame. Then cut your ribbon and glue to the back of the sign. 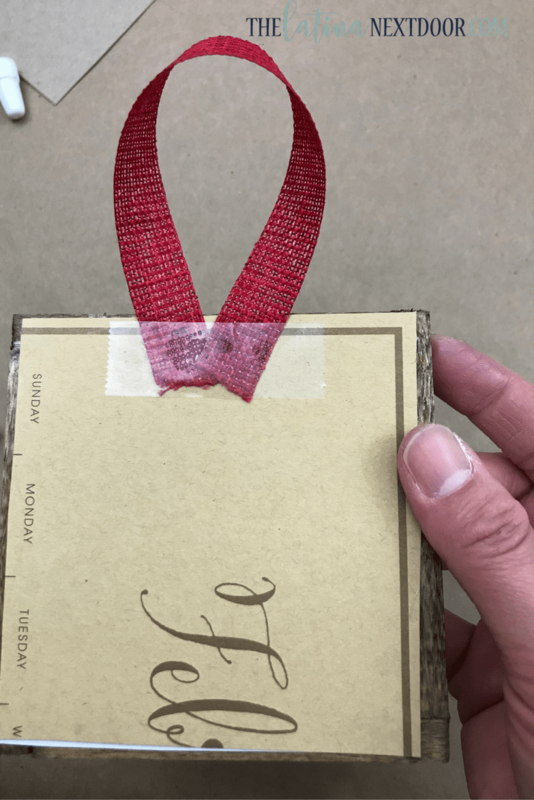 Quick tip: I like to place clear tape across the back of the ribbon to hold it down while it dries and then I just leave it there since it’s going to get covered anyway. You can leave it like this, but I added another cardboard layer to make it cleaner on the back. And that’s it! There you have it! An adorable mini farmhouse wood sign that you can hang on your Christmas tree and everyone will love! These are the cutest things EVER! I am totally making some of these guys. Thanks so much. Thank you Michelle! The best part is they are so easy & cheap to make! You will have so much fun. LOOOOOVE this! I love that it would not only make great Christmas ornaments like you did but you could do this for any holiday. Smaller ones for gift tags . . . so many possibilities! I love the gift tag idea!!!!! Now I am the one getting more possibilities in my head… LOL! Can’t get enough of the fun farmhouse signs. Love the cute idea! I can totally do this and need to make some of these. Pinned. Thank you!I am sure you would make some fabulous ones! So cute! These would look great on my tree, I may need to make some! 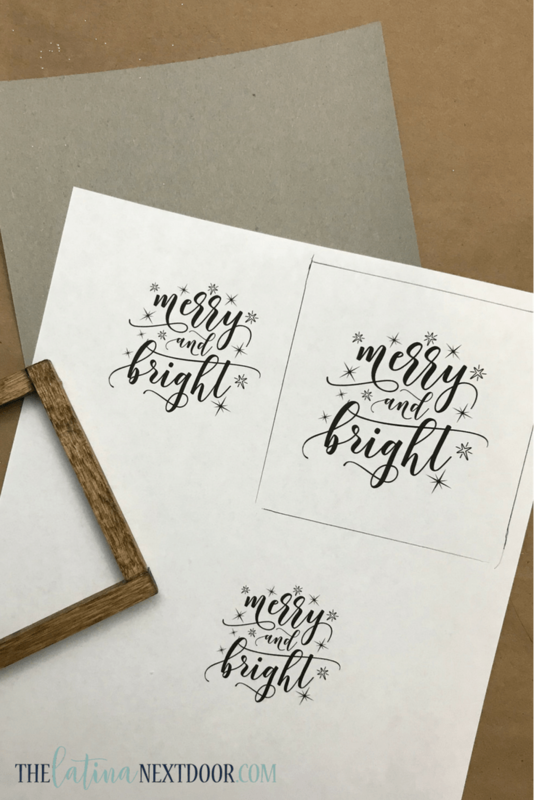 I love the printables you chose, and the rustic farmhouse appeal of these ornaments! Pinned! How adorable these are. I love how you can personalize the sayings. Where did you find the phrases that you printed. I don’t have a silhouette to print the ones they make? Can I still use their pictures without having a silhouette? Hello Stacy! I just printed some images I was able to get online and I did it on regular copy paper. No machine required! I hope that helps! Hi! I want to make these! What glue did you use to adhere the printable to the cardboard? And do you have a link to the printables you used? 😍 I love those ones! I think I just used double-sided tape, however you can also use a glue stick if you want to use glue… that way the paper doesn’t get bulky. These printables were a limited time freebie at the time I made these last year. They are no longer available, I am so sorry! 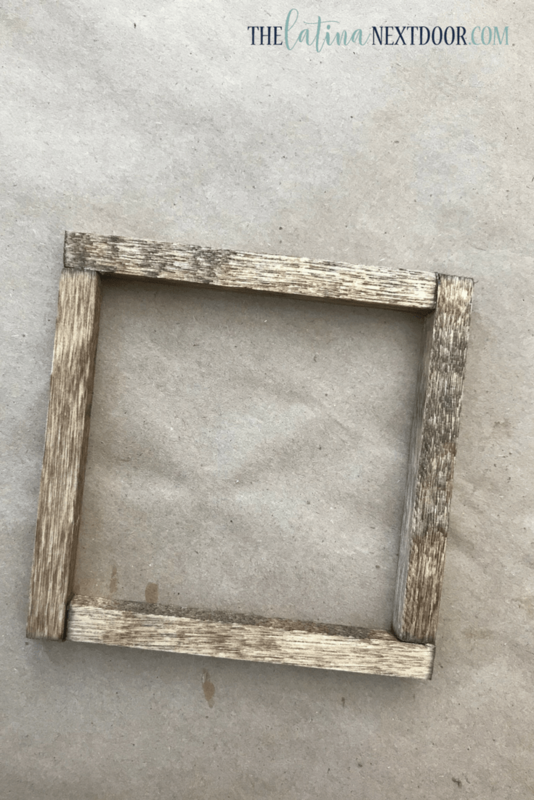 Do you have the template you used for the wooden signs? They are absolutely adorable. Oh, I wish I had a template! These were from a limited time freebie last year. If they were still available I would share but they are not. I’m so sorry!